Nairobi — World Record holder and two-time Olympic champion in the men 800m, David Rudisha is mourning the death of his father, Daniel Matasi Rudisha, who passed on Wednesday night at 73 years. "Me and my ailing father,,,, wish him quick recovery. Long live my dad," Rudisha posted on Tuesday March 5, 2019. "Our beloved father sadly left us last night. 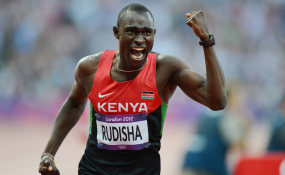 He had recovered and was on his way to fine health having been taken off the Intensive Care Unit," Rudisha, who holds the 1:40.91 world record in 800m told SportPesa News. "He was talking well and joking as usual while undergoing his dialysis treatment but at around 11pm, he suffered a sudden heart attack and efforts to resuscitate him did not bear any fruit," the London 2012 and Rio 2016 Olympics gold winner said on Thursday morning," he added.